Shortly after meeting Claire, Ben is thrust into chaos. Strangers attempt to trick him into revealing sensitive information about his delivery route and goods, while the owner of The Never-Open Desert Diner -- an old man named Walt Butterfield -- is tailing Ben all over and keeping a watchful eye on his activities. 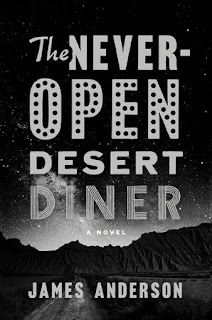 When things become too dangerous, Ben sets out to solve a decades-old mystery involving The Never-Open Desert Diner with hopes of saving Claire and putting an end to the violence forever. Do you remember that 1997 movie U-Turn, featuring Sean Penn? Sean Penn is on his way to Las Vegas when his car breaks down in a small Arizona desert town called Superior. While he stays in town waiting for the shady auto mechanic to fix his car (Billy Bob Thornton), Sean Penn gets beat up, robbed, seduced, and caught in an ugly web of violence and crime. Well, this novel reminded me a lot of that movie. The story started out great -- there was enough intrigue, mystery, and humor to retain my attention. But I found myself losing interest toward the middle of the novel, and I'm still trying to put my finger on why. I think I was hoping for more interaction between Ben and every other character who wasn't Walt or Claire, who were my least favorite characters. Despite all we learned about Walt and Claire, I just couldn't connect with these characters, and wasn't interested in what happened to them. What I did love about The Never-Open Desert Diner was James Anderson's writing style. He writes well, and he's witty in an understated way. I'd definitely be open to reading his next novel, and look forward to seeing what he does differently in his next book. Unfortunately, I can't say The Never-Open Desert Diner will be lingering in my mind long after posting this blog.